President Muhammadu Buhari Thursday in Abuja urged the National Association of Resident Doctors (NARD) to shelve its threatened strike action and give the Federal Government more time to address the grievances of doctors. Speaking at a meeting with the leadership of the Nigerian Medical Association (NMA), President Buhari gave the doctors an assurance that no agreements duly entered into by the Federal Government will be dishonoured by his administration. Decrying the adverse impact of the fall in oil prices on the Federal Government’s spending plans for health and other sectors, President Buhari said that his administration will continue to do its best to address issues that are of concern to doctors and other Nigerians. The President also gave the NMA delegation an insight into his administration’s plan to establish 10,000 primary healthcare centres across the country in the next two years with the objective of providing better healthcare for about 100 million Nigerians. He also told the delegation led by NMA President, Dr. Kayode Obembe that the National Health Act will soon be gazetted and a steering committee appointed to oversee its implementation. At a separate meeting with the leadership of the Pharmaceutical Society of Nigeria (PSN), President Buhari promised that his administration will evolve and implement measures to curb friction and disharmony among the professional groups in the health sector. The President urged the PSN to work more closely with the National Agency for Food and Drugs Administration and Control (NAFDAC) to curb the sale of fake medicines in the country. 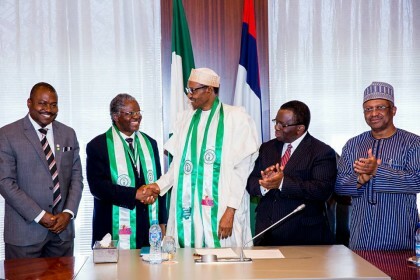 The President of the PSN, Ahmed Ibrahim Yakasai assured President Buhari that pharmacists in Nigeria were ready to work in harmony with other professionals in the health sector to help the Federal Government achieve its objective of improving healthcare services in the country.